All creative teams have a pile of great ideas crumpled up under their desks or in the back of their minds that deserve to be seen (and submitted for awards). The National Advertising Benevolent Society (NABS) decided to raise awareness and funds by enabling creatives to run the award-worthy ideas that never made it into market. The first fundraiser disguised as a magazine filled with 100% ads was created by NABS and agency Lg2. There was no content, just a place for ads that creatives wanted to run, but for whatever reason, haven’t been able to. It's questionable whether or not some award-winning work has run in a real publication. In order to garner attention with a hyperbolic look at the industry that would get people talking, the team created the world’s first magazine designed to be filled with 100% ads. How do you launch a magazine that encourages you to do anything you want in an ad? With a commercial that was everything lg2 wanted to do in an ad. The team cast who they wanted, wrote what they wanted, and shot it how they wanted while keeping in mind that the audience is full of cynical ad people. The video, which launched on Facebook and YouTube, was a catalyst for entries and it got people talking. The story jumped to the #1 most read on Adweek and agency creatives visited the site to enter their ad, with the hope that it could potentially be submitted for awards. However, once there, it was revealed that the entire initiative was a fundraiser for NABS disguised as a parody magazine. And their “media buy” was actually their donation. During the campaign, social posts with parody ads were targeted at people who worked in creative roles at agencies across the country, showing them what kind of content will be published in IT RAN, inspiring them to get weird with their submissions. Through moderation, some light heckling was sparked between agencies to make sure they were fired up and eager to submit. 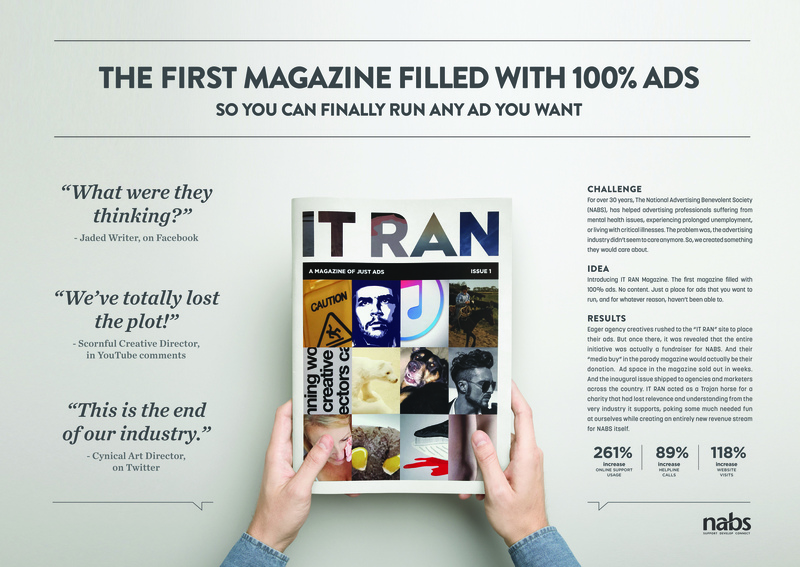 Creatives would then, with client approval, submit their “ads” to the itran.biz microsite. The “ad space” sold out in weeks, and the inaugural issues were distributed in fall 2016 to agencies and marketers around the world. The campaign effectively advertised to cynical advertisers and poked fun at the industry while creating an entirely new revenue stream for NABS itself. Helpline calls increased by 89% during campaign period, there was a 118% year-over-year increase in website visits directly tied to campaign, and use of online NABS support services increased by 261%.